It's nearly February and we're still waiting for snow in Glacier Country. By most standards we have snow, but not by Glacier standards. The lack of snow this winter is somewhat of a surprise due to the fact that the forecasters all agreed it would be another snow filled winter - well, it's not happened yet. There still is time. February and March can be huge months for snow so I'm crossing my fingers that we'll get the snow we need to fill the water budget for the 2012 summer. 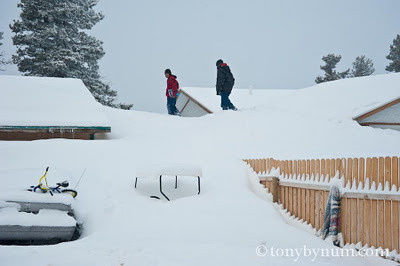 Below is a photograph from last year's snow accumulation in East Glacier Park. It's nothing like this this winter! Children walking from roof top to roof top on their way to School in East Glacier Park, winter 2010-2011 - an exceptional snow year in East Glacier Park, MT. If we don't get the snow, travelers and visitors to the Park should plan a see the going to the sun road open a bit earlier this year! Yeah, that would be a change over the last 5 years when it's not opened until July in most cases. We still could have wet cool spring, and that could slow things down, but we will need a few more good dumps of snow up on Logan Pass. If we don't get it, I think we'll see it open by early June this year, just a guess. The wind has been relentless this year! Even more so than usual. We've seen more rigs, buses and vehicles blown of the road over the past two months than we've seen in the past years combined. It's really been non stop wind! Today is no exception, I watched on the news that we hit about 100 mph yesterday and Saturday. Wind blown snow across ice on a small pond east of Glacier National Park, MT on the Blackfeet Indian Reservation. Shot with Nikon camera, 14-24mm f 2.8 lens @ 14mm, f22, two stop grad. RRS head and legs, processed in Lightroom. 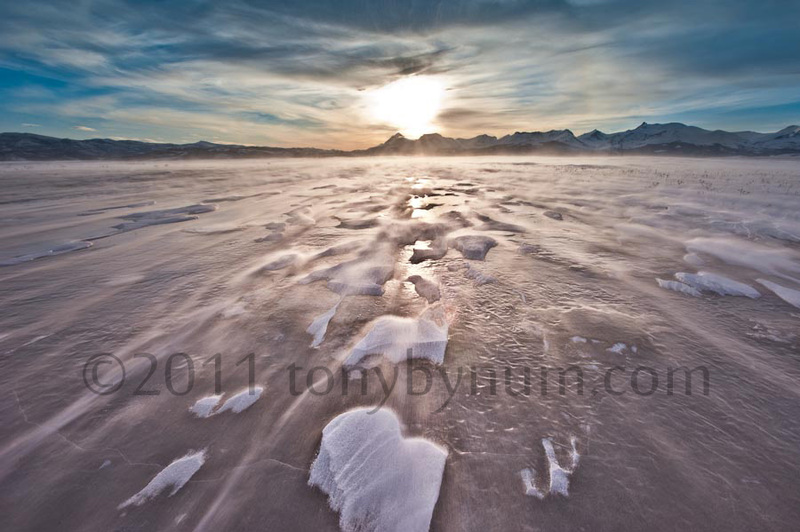 I have a new Tony Bynum Photography website up and running if you care to check it out . . . www.tonybynum.com. I also published a new project that anyone who cares about Glacier National Park will want to look at and share. It's a conservation photography project that includes an interactive map of the Blackfeet Reservation on Glacier Park's east side. The map has videos and photos of the oil exploration and drilling on the Blackfeet Indian Reservation and the Rocky Mountain Front. It's really quite remarkable what's going on, please take a look and leave a comment if you can, I'd like to hear what you all think. I'm going to change this blog a bit. I want to make it more interactive, if you're interested in guest blogging please email me at tony at tonybynum dot com. I'd like to share this platform with others who write about Glacier National Park.